Light with crispy edges with a creamy texture on the inside, these pancakes are a delicious addition to your collection of breakfast and brunch recipes. They are so easy to make and really impressive. Assemble everything and set it aside, beat the egg whites when you’re ready then simply mix. In just a few minutes you will have light beautiful pancakes. You could also serve these as a desert with whipped cream or ice cream. You can take the blueberry’s out and use any summer berry. Make them tiny to use for very luxurious canapes with a little salmon roe and creme frache. 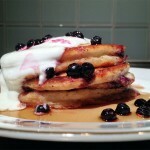 Ricotta Blueberry Pancakes are simple to make, if the milk is not enough you can add a bit extra. Be generous with the butter when you fry them it gives them a wonderful luxuriousness. This should give you 6 to 8 pancakes depending on their size. Sift the dry ingredients in to a bowl large enough to hold all the ingredients. In another small bowl mix the milk, eggs and ricotta well and set aside. Add the liquids into the flour and mix until it is well incorporated. If its too stiff you can add a little milk. But the mix should be quite thick. Take a third of the egg whites and fold them into the batter to loosen it so it will take the rest more easily. Take the remaining egg whites and fold them into the loosened batter. Heat the butter and oil in a frying pan. When hot, using a large spoon drop some batter into the hot frying pan and cook each pancake for about 2 1/2 minutes on each side. I don't have much to say about this recipe, it works well and I really love the texture you get. They are much lighter than regular pancakes. Give this recipe a try its really worth it. 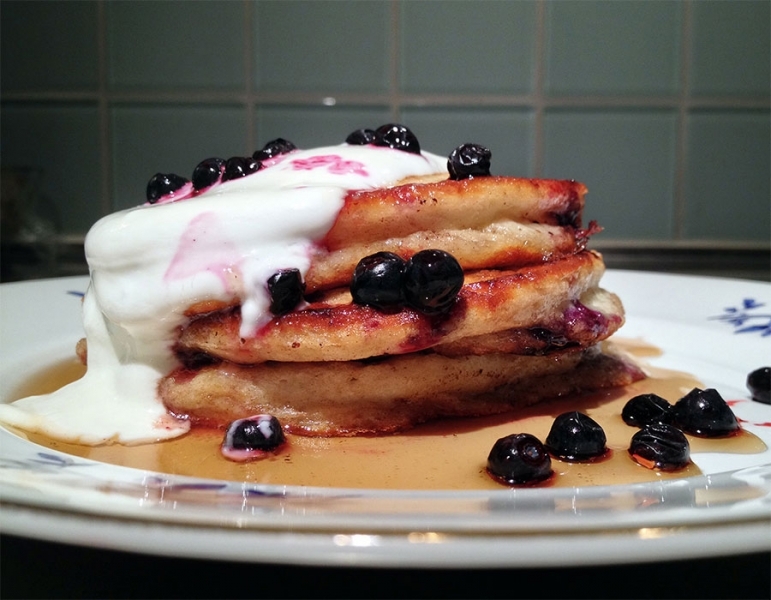 I serve these with a little sweetened vanilla flavored yogurt and maple syrup. Another way of serving this would be with a little creme frache and honey. And as I said above these could be made tiny for canapes.